Last April, the Israeli prime minister claimed that the country’s intelligence service had managed to collect thousands of documents revealing how Iran had lied to the world after signing the nuclear deal. Israeli Prime Minister Benjamin Netanyahu asked for US President Donald Trump’s support before an intelligence operation in Iran, Hadashot TV news reported. According to Israeli television, Netanyahu discussed the mission with POTUS when the two met in Davos, Switzerland, last January, with the prime minister seeking US assistance if the operation were to go awry. The mission in the report was disclosed by Netanyahu back in April 2018 – just days ahead of the US withdrawal from the Iran nuclear deal. 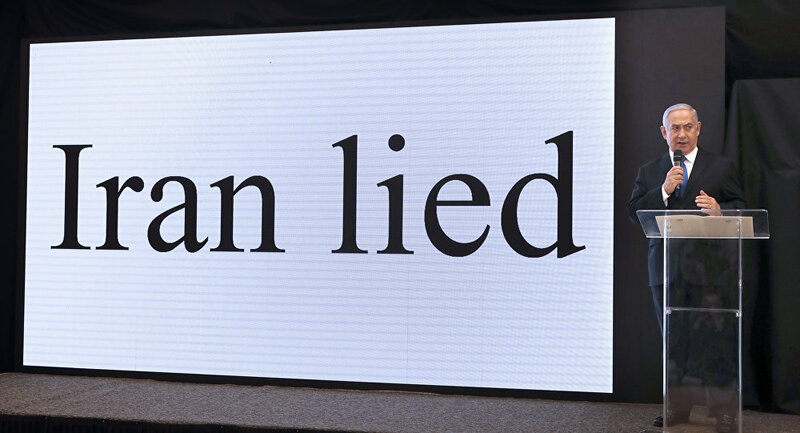 In a speech broadcast live, the prime minister accused Iran of lying about its nuclear capabilities, and exposed information that allegedly showed that the Islamic Republic was continually expanding its programme. He claimed that the Israeli intelligence service had managed to collect about half a tonne of secret files, including 55,000 pages of documents, proving that Iran possessed a military nuclear project. “Iran lied. Big time”, Netanyahu said at the time, praising the operation as one of the “greatest achievements” of Israeli intelligence. According to The Times of Israel, citing Hadashot’s report, it was not clear how Trump responded to Netanyahu’s request, or whether the information on the operation was new to him. The New York Times previously cited senior Israeli officials as saying that Trump was briefed on the raid on the warehouse with documents by Mossad chief Yossi Cohen. The newspaper wrote that agents from Israel’s Mossad had discovered the top-secret location of a warehouse used to store files on Iran’s nuclear programme, raided the building and managed to bring a trove of documents back to Israel that same night. “We’ve shared this material with the United States, and the United States can vouch for its authenticity. […] These files conclusively prove that Iran is brazenly lying when it says it never had a nuclear weapons programme. The files prove it”, Netanyahu said in April. Following the speech, the UN’s nuclear watchdog, the International Atomic Energy Agency (IAEA), stated that it had “no credible” indications that Iran was working on developing a nuclear “explosive device” after 2009. Netanyahu reiterated his claims during his speech at the UN General Assembly in September, but Iranian Foreign Minister Javad Zarif dismissed them as an “arts and crafts show”. No arts & craft show will ever obfuscate that Israel is only regime in our region with a *secret* and *undeclared* nuclear weapons program — including an *actual atomic arsenal*. Time for Israel to fess up and open its illegal nuclear weapons program to international inspectors. The speech came a few days before Trump announced the withdrawal of the US from the Joint Comprehensive Plan of Action, commonly known as the Iran nuclear deal. The accord was signed in 2015 by Iran and the P5+1 states – Russia, the US, China, France, the UK plus Germany – and stipulated the gradual lifting of anti-Tehran sanctions in exchange for the Islamic Republic maintaining the peaceful nature of its nuclear programme. Trump announced the decision to reinstate restrictions against Iran, targeting its shipping, shipbuilding, energy, financial, and other sectors, with a stated goal to cut Tehran’s exports to zero.